If you are an emerging computer tech and you haven’t already become accustom to using the ipconfig command, you soon will. This command is most commonly used at the DOS prompt to see a computer’s current IP configuration. Using this command with three different switches also allows you to refresh a computer’s network settings which can be very useful when troubleshooting network issues. In the following tutorial, I would like to show you how you can create a batch file that will run this command along with its switches to quickly refresh a computer’s network settings. Before we get started, it might be helpful for you to first understand what a batch file is. A batch file is a simple text file that can run a series of DOS commands when executed. They can be created using Windows Notepad or any other plain text editor. You simply enter the DOS commands that you would like to run and save the file with a .bat extension. You can then execute it by simply double clicking on it. Step 1: Click on the “Start” menu and go to “All Programs”. Go to “Accessories” and open “Notepad”. Step 2: In Notepad, type in the following commands which will be run to refresh a computer’s network settings. The “release” switch will release your current IP address settings. 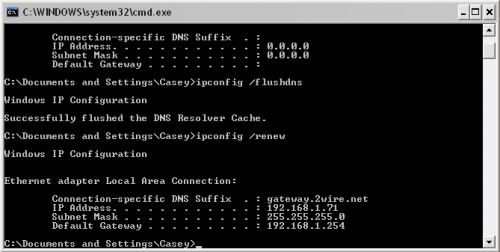 The “flushdns” switch will flush the DNS resolver cache. The “renew” switch will renew your IP address settings. Step 3: Now click on the “File” menu and select “Save As”. Change the “Save As Type” field to “All Files” located near the bottom of the window. Now enter a “File Name” such as “Refresh.bat” without the quotes. It is important that you put the .bat extension on the end of the file name or you will not be able to execute it as a batch file. Choose a “Save In” location and click the “Save” button to save it. Step 4: Now you can run your new batch file by double clicking on it. After the batch file has finished executing, the computer’s network settings will be refreshed. You can put this file on your desktop for quick access or on a flash drive to use on other computers. It can be run on any Windows machine including XP and Vista. Remember, these commands will only work if the computer is set up to obtain an IP address automatically and will not work if the computer has a hard-coded IP address. If you have any experience using batch files, please feel free to share what you use them for. Wow, thanks for sharing this with us. I created one on my computer and it worked like a charm. I love the menus and even the change of color. Thanks to your idea, I created my own file. (I took out the ascii graphics in the Menu’s). Sir can you teach me how to send a batch file to a computer using internet and from that computer it will send a copy of itself to its network like a virus? This is wonderful. Thanks fellas. I have solved the issue. saved file as .BAT and it works… Doh!!!! Thank You very much, I no dont have to walk my little peoples through this operation anymore. Saved time and energy. 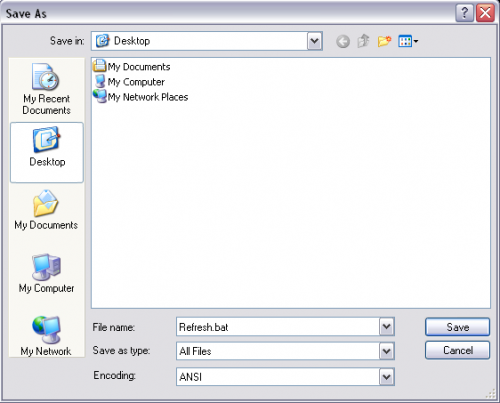 It’s also useful convert batch file to exe prior to use, I made it with help of Dr.Batcher ( http://www.drbatcher.com ). I have an issue with DNS zone. Each day is fails and I have to reload the zone. Can I create a bat file to reload 1 DNS so that I can schedule it as a task. Thanks for this. It was really useful yet simple to do. Can anyone explain why I’d want to execute each of these functions. hi just again how to know some one was been see your file by ip addressee and how to get him address? ive created a batch file chat . but it only works lan how can i make it through internet not lan?